The building that Idletyme Brewing occupies on Stowe's Mountain Road has a long history of offering sustenance to locals. A cider house early in the 20th century, it later became the well-loved Shed Restaurant & Brewery for nearly half a century, from the mid-1960s to 2011. After about three years as Crop Bistro & Brewery, the restaurant changed hands again: Michael and Laura Kloeti, owners of Michael's on the Hill in Waterbury Center, purchased it last May and changed its name to Idletyme in November. While Michael's on the Hill is known for fine dining, the Kloetis say they envision the pub on Mountain Road as a local hangout where people might eat several times a week. 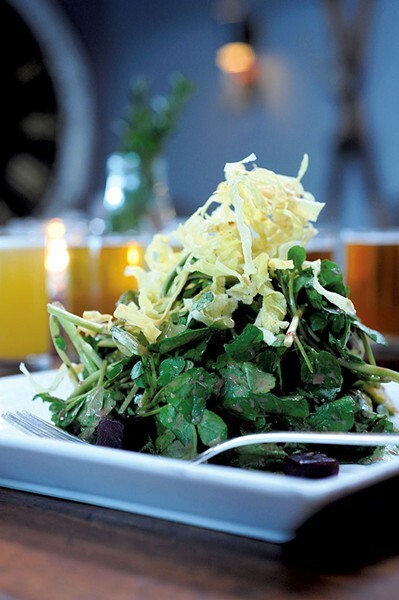 The current menu offers basics such as chicken and salmon entrées, pub classics, a nice seasonal salad list (one current option combines beets, Brussels sprouts and watercress), and an extensive appetizer list with choices such as fried pickle spears and cheese fritters. Helming the kitchen is Jason Bissell, 31, a Vermont native who honed his cooking skills at a restaurant in Durango, Colo., then returned home to work at Michael's for several years. 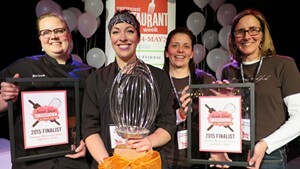 The Kloetis recently snagged pastry chef Nicole Maddox, a New England Culinary Institute graduate. Last year, while working at Winooski's Waterworks Food + Drink, she was the victor at the Vermont Restaurant Week Sweet Start Smackdown, a confection competition. When I first pulled into Idletyme's large parking lot, on a Saturday night, all the spaces were taken save one. I entered through the main door and was greeted by cows. No, no, this is not a slur on the hostesses — lovely, kind people who graciously go out of their way to accommodate you even when you're the inconsiderate blockhead who called for a same-day reservation. I'm talking about the oversize cowskin booths. And the pictures of cows. At one meal, seated directly beneath a bovine that seemed to be watching me, I was glad I ordered pork. The décor in the main dining room — much of it inherited from Crop — has a lot going on: a fireplace, hanging skis, single lightbulbs dangling from the ceiling. A second dining room in the back is cow-free and has a more elegant, cohesive feel. Yet another option — the one I preferred — is to dine in one of the two bars. The first bar space, equipped with its own entrance, has a homey, local-watering-hole feel. 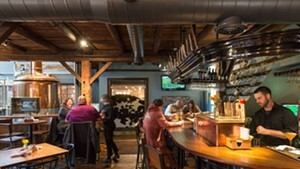 Exposed wooden beams line the ceiling, and one corner holds three brewing vats protected by a mahogany railing. It's the kind of place that offers comfort on a cold winter night. The second bar, located in the center of the restaurant, is more contemporary. White-painted fake trees adorned with strings of white mini lights separate diners, creating an intimate feel. If the mission of Idletyme is to serve simple, high-value food to both locals and visitors coming down the mountain from an afternoon of skiing, the restaurant generally delivers. That was evident when, on another visit, I tried the most basic of pub staples: the burger. After a short wait, which I spent sipping one of my six beer samples, a massive creation arrived. Arugula and tomato spilled from a buttery brioche bun, pickled onions — stained a pinkish-purple color — stuck out in every direction, and chive mayo oozed down the sides. My mom jokes that I would have put ketchup on my cereal if she had let me. But I have a deal with myself that I will always first try a few bites of each dish so I can taste it as the chef intended. In this burger's case, those first bites were juicy and complex. The pickled onions added the sweet, vinegary flavor that I generally crave in ketchup. This, friends, was the first burger of my life that I ate voluntarily without the aid of my beloved condiment. At $12, it's also a deal. I called my best friend afterward to complain that I wanted a bigger stomach, since I wasn't able to finish the thing. One caution: Eat the burger quickly; the bottom bun tends to get a little soggy if you linger. 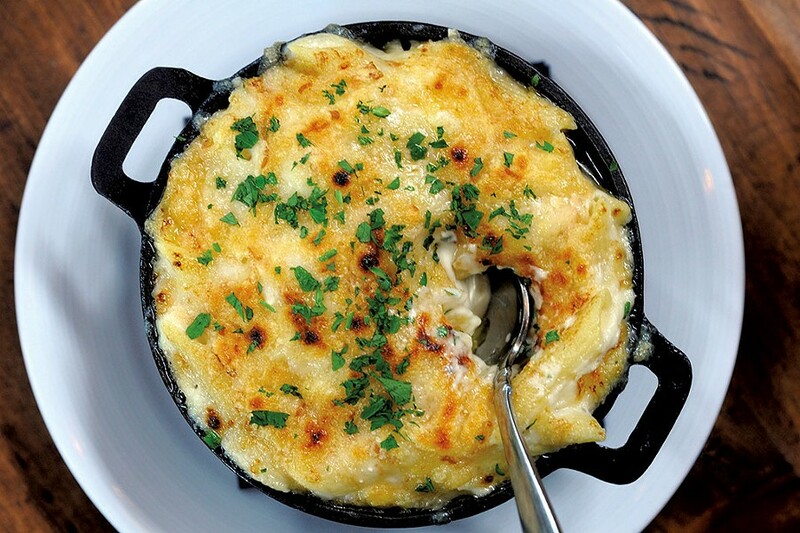 Another dish that exemplifies Idletyme's solid grasp of pub basics is the mac and cheese. Served in a cast-iron bowl, it's a masterpiece. When I stuck my fork in and pulled, a fat, dripping ribbon of cheese followed. The casserole clearly owed its coherence to a carefully crafted béchamel, with cheese stirred in as the milk mixture simmered, yielding a sauce instead of lumps. This, too, was addictive pub fare to satisfy the soul at an affordable price — $18. In a few instances, however, I wished the kitchen would stick to the simplicity of those core dishes. Take the s'mores dessert. 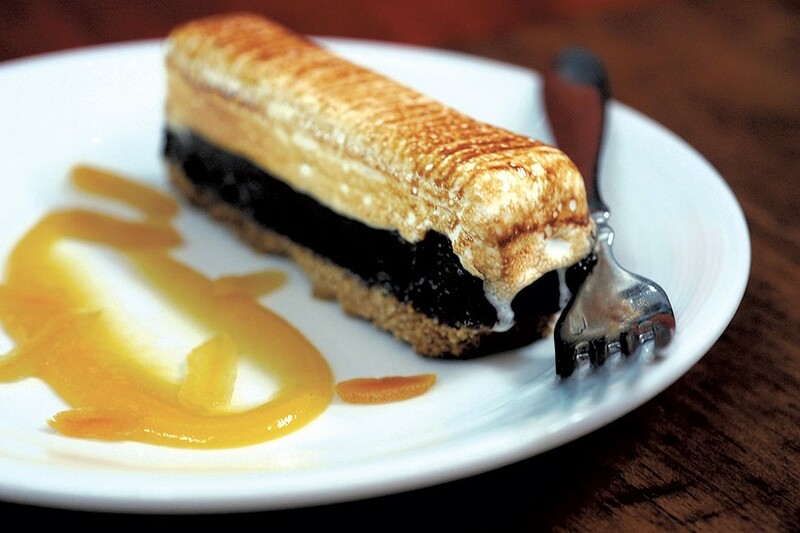 Graham cracker crust was topped with rich, fudgy chocolate and finished with toasted marshmallow crème. It was sinfully rich and possibly the best thing on the menu. But for me, the artsy painting of apricot sauce beside it on the dish was too much. Sure, it added a visual element, but it also unnecessarily complicated the flavors of the s'mores. I felt the same about the cheese fritters. The cheese was oozy and gooey, served piping hot. I adored the cheese-to-batter ratio, which seemed to be about 90-to-10. But the fritters were drizzled with a puzzling sauce whose only discernible flavor was lime. I spent more time trying to figure out the sauce's components and whether I liked it with the cheese than I did enjoying the food. Later, I asked Bissell why he picked lime. 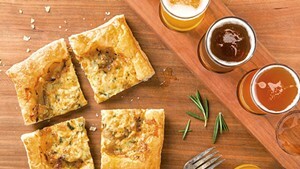 "To balance acidity to the richness of the cheese and to complement the jalapeño in the sauce," he said. Now everything fell into place — I hadn't perceived the jalapeños. Were the peppers mild? Were my jalapeño sensors not working? Had the chef forgotten to add them or overbalanced them with lime? Perhaps it was a one-time mistake. Still, my perplexity over the sauce points to an overarching theme at Idletyme: Bissell takes some of the control away from diners. The salads come simply dressed; sauces are sometimes added in advance; sides are already paired with mains. Sometimes this works: For those of us who like our greens to come with dressing but not be drowned in it, it's delightful. And most of the side-and-entrée matches make sense. Mashed potatoes with a chicken breast? Sounds fine to me. But when it came to the cheese fritters, letting me decide how to use the sauce, whether to dunk or avoid, would have enhanced my experience. Not all the sides work, either, and when that's the case, diners may feel a little cheated after spending $26-plus. The pork shank entrée was tender, the flavor complex. But the bread pudding served with it was eggy and stiff. The unpleasant texture was all the more noticeable given that the toffee bread pudding on the dessert menu had just the right texture — a little give, without being mushy. The beer is still brewed in-house by Will Gilson, who became Crop's head brewer in 2013, and there are 10 house brews on tap. I particularly enjoyed the Idletyme double IPA — complex and hoppy, like most of my favorite beers. Our server in the main dining room always appeared the moment we needed her. She never rushed us, even when — on a Saturday night — my dining partner and I ordered dessert after spending two hours trying multiple appetizers and lingering over our mains. At the side bar on a lazy Wednesday afternoon, the bartender made an attempt at conversation, but when it became obvious I wasn't in a chatty mood, she politely went back to reading her paper. At the lounge bar, the bartender skillfully helped me pick out a beer that would match my dinner. He, too, kept his cool, even as nearly every patron pointed to the glass jar holding a housemade, fruit-infused liquor and inquired, "What's that?" Parents will find this joint pretty kid-friendly, with a children's menu divided into appetizers and entrées. I remember what I liked when I was little, and this menu has lots of it: veggies and dip, chicken fingers, pasta, PB&J. 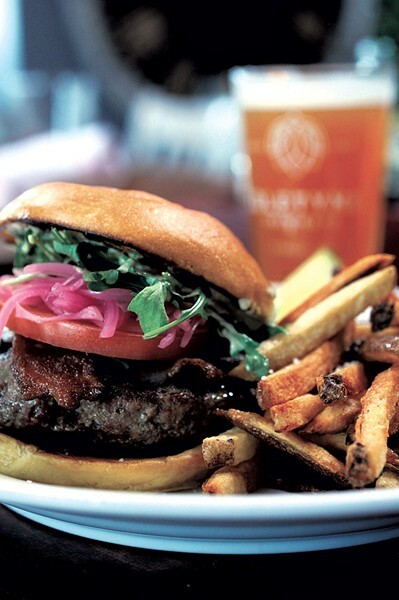 Overall, Idletyme hits its mark, delivering great beer and great food. For the most bang for your buck, go for the burger or the mac and cheese. And don't miss Maddox's dessert menu. Some of the best dishes in the place are the cheesecake with sour cherries served in a mason jar, the aforementioned s'mores and the rich, sweet, sticky toffee pudding. Minor issues aside, the transition from Crop to Idletyme appears to have been a smooth one. I look forward to visiting in summer, when I'll be able to soak up some sun while enjoying a beer on the patio.